No matter if you or your kids are fans of astronomy or just like to gaze at stars at night. Having a star projector can really make your nights more relaxing and serve as a wonderful setting that helps you fall asleep much faster. Yes, it adds a little light to your room but the relaxing atmosphere can help you fall asleep much faster. Keeping this in mind, we have selected the top 3 star projectors that will leave the biggest fans of astronomy content. 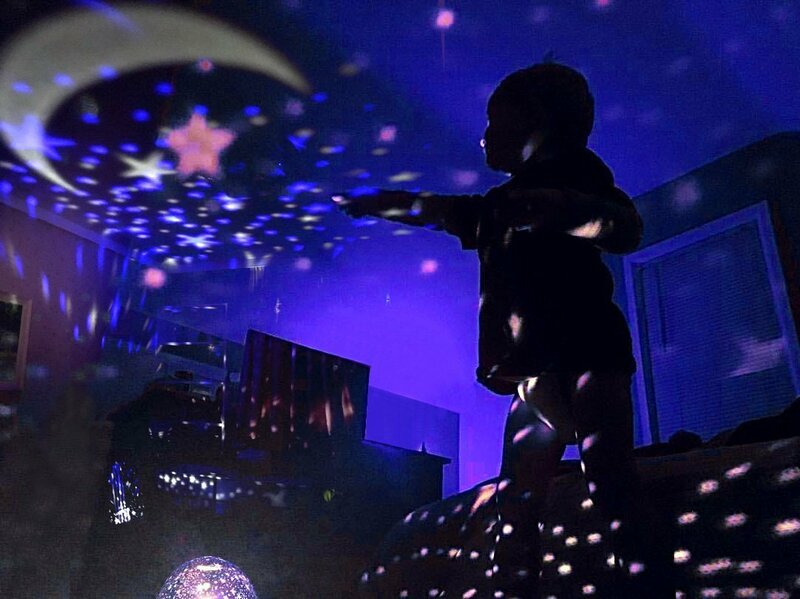 When it comes to installing a star projector in your children’s room, you want one that is not only relaxing but colourful. Children are attracted to colors and the Star Sky Night Lamp ensures that the room is nicely lit up with nice, colourful stars for your child to gaze at. The projector comes with multiple functions that make sure that your children have a great time as they doze off to sleep. Some children don’t like to sleep with the lights off, so this projector acts well as a night lamp also. It projects a crescent moon with tons of stars surrounding it. It comes with time control so you can set it to project from 5-95 minutes after which it turns off automatically. It is quite portable also as it comes with the option to power through 4 AAA batteries or a USB port. 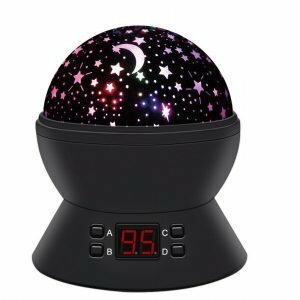 The beautiful design of stars and the moon along with portability and multiple function make this star projector an excellent buy for anyone. 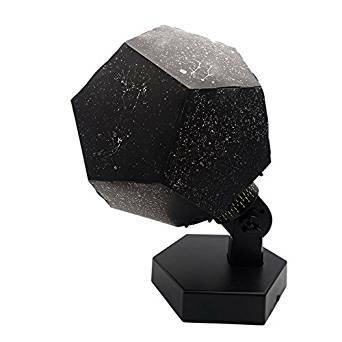 If you and your children are more into astronomy and want a better depiction of stars in your room then the ScienceGeek Star Lamp Projector is a better option. Unlike the other two projectors which are more directed towards kids, so they have stars drawn out. This projector actually portrays the stars as you would see them out at night. This projector will help children learn about the outer space as it also has some constellations already mapped out on its projection. Along with the projector being a learning experience, it also servers well as a night lamp for those children that are scared to sleep in the dark. One thing we didn’t like about this projector is that it only works with 3 AA batteries, no option to use it with an outlet. 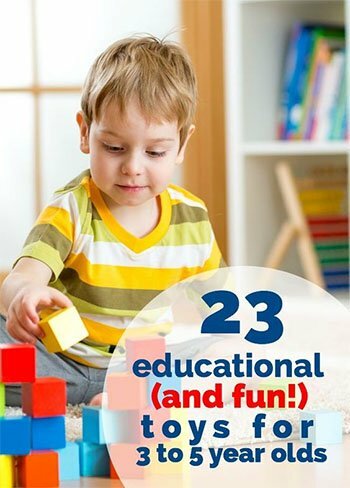 Overall, this is a great projector that allows for both learning and a relaxing environment as your child goes to sleep. 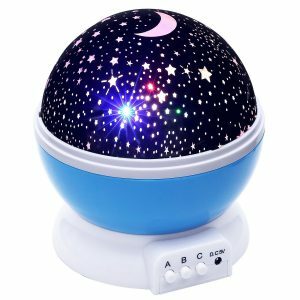 The Lizber Baby Night Light projector is another colourful star and moon projector that works well in children’s room. It fills the room with tons of stars and colourful moon that make the environment quite pleasing. The projector allows you to control what is displayed in the sense that it has three modes that control the light displayed. “A” projects warm white lights, “B” changes from single light to multiple coloured lights used, and “C” starts to rotate the stars and the moon. This allows you to control the projection as you please. The projector works well to surround the whole room with stars. It works with batteries and can also be powered through a USB cable. 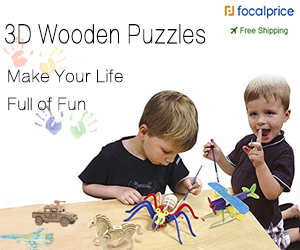 Overall, the projector works well and for it’s low price is a wonderful buy for your child’s room. That ends our list of the 3 best star projectors that you can buy. You should first decide what the use of the star projector would be and then select one accordingly. 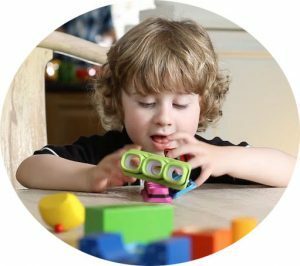 If you want your children to learn from it rather than just have it as a decoration piece then the ScienceGeek projector is your best bet. Otherwise, the other two projectors would be fine. Keep in mind that the Star Sky Night Lamp has more functions and just a better design.